Lisbon’s transformation from low-profile, old-fashioned, somewhat down-at-heel city to Hipster Capital of Europe has been nothing if not dramatic. It slipped under the travel radar for decades, but today the secret is well and truly out. The combination of affordability, a scenic location, welcoming vibe and some of the sunniest skies in Europe have attracted hordes of digital nomads and enterprising young start ups. When Lisboa assumed hosting duties for WebSummit in 2016, it rubber stamped the city’s new status as a truly modern city, and huge amounts of public money have been pumped into refurbishing tatty buildings and giving the whole city a polished feel. But amid the gentrification of formerly-shabby docklands, the gin bars frequented by artfully-bearded hipsters, the surfers and the slick Michelin-starred restaurants, Lisbon retains a sense of history that will endure once the ‘hipster capital’ baton is passed to the next city to up its gentrification game. Ancient blue and white azulejo tiles continue to dazzle alongside the colourful street art; laundry flaps from the windows of homes that cling to the steep, slippery streets (wear shoes with some grip – many a tourist has come a cropper descending Lisbon’s famous hills); elderly women keep a watchful eye over goings on below their balconies; simple family restaurants serve strong coffee, hearty set meals and jugs of house wine at absurdly cheap prices; and the grand old castles, palaces and monuments that recall Portugal’s wealthy past stand proudly amid the white, terracotta-roofed homes. Its small size – Lisbon ‘proper’ has fewer than one million residents, and is easily explored on foot – gives it a friendlier vibe than many capital cities, and visitors can pack a lot into a weekend break here. Reflecting its Age of Discovery, Lisbon is a multi-cultural city, and the influence of migrants from Portugal’s former colonies are everywhere to be seen. There’s an Indian corner shop on virtually every street, Brazilian capoeira artists perform impressive flips and tricks for tourists on Rua Augusta; while musicians from Cabo Verde provide a musical backdrop to afternoon drinks on the flagstones of downtown pracas (public squares). Lisbon’s big ticket attractions are worth at least a quick visit, and the city’s compact size makes it easy to get a glimpse of many key sights without any real effort. 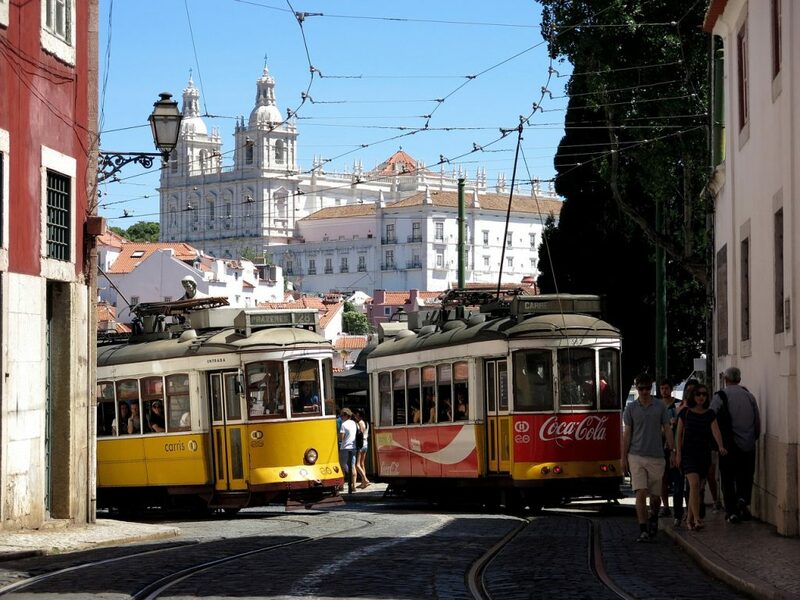 Famously built on Seven Hills, Lisbon is fun – if tiring – to explore on foot, but the (in)famous number 28 Tram (watch out for pickpockets) and Santa Justa lift are both leg-saving ways of seeing the sights, and major tourist attractions in their own right. Jump on the number 28 electrico at newly-hip Martim Moniz square to rattle up and down the streets of downtown Lisbon, ticking off major sites of interest – such as the Cathedral, the Saint George Castle and the Fado houses of Alfama as it goes. If you don’t fancy the tram, another great way of tackling those hills is to jump on an electric bike, where some power-assisted pedalling will get you to each of the seven summits. The world’s most famous tram? Simply strolling around the Baixa (downtown) is a good way to tick off sights – start at Praca do Comercio (metro Terreiro do Paco) to admire the grand central square, stop for waterfront drinks then stroll along the busy Rua Augusta, trying to ignore the human statues and tat-sellers as you go, along to the little ginjinha (sour cherry liqueur) bars and grand town houses of Rossio square. It’s also worth setting aside at least an afternoon to visit the Belem district – the enormous Monastery here is nothing if not dramatic, the waterfront tower merits an external view – with huge crowds, and little more to see than a steep stairwell leading to some (admittedly impressive) views from the top, it’s not really worth the time or entrance fee to go inside. Surfers and beach lovers can cheat by admiring the view of Belem from the windows of the train as it trundles along from Cais do Sodre, downtown, along the Estoril coast to Cascais. Another worthy day trip is Sintra. The turreted palaces and cloud-swathed castles of this stunning mountain town mean it is near-impossible to describe it without using the word ‘fairytale’. Take the train from the grand 19th Century railway station at Rossio – a tourist attraction in its own right – or else book a tour. This highly-rated one goes not only to Sintra, but Estoril and Cascais too. Speaking of tours, if you enjoy a guided introduction to a city try Urban Adventures’ best-selling Experience Lisbon Walk, or – for a more sensory hello – sign up for some Sunset, Fado & Tapas. 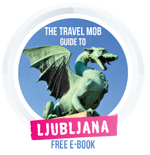 Finally, travel experts Get Your Guide list over 600 things to do in Lisboa, and will also vend you a value-for-money Tourist Card which offers you free entry into most of the attractions mentioned in this guide! Lisbon’s rebirth as a hipster hangout is hard to ignore, and cool kids have made their presence felt particularly strongly in formerly run-down areas such as Alcantara, Cais do Sodre and Martim Moniz. Near obligatory on any cool kid’s agenda is a visit to LX Factory (the LX shorthand comes from former names from this ancient city such as Luxbona, Lixbuna and Ulixbone) where a complex of abandoned warehouses has been transformed into an artsy collection of bars, restaurants, shops and start-up offices. Upstairs, the bar-restaurant Rio Maravilha offers late-night DJ sessions and terrific views over the River Tagus out to the Cristo Rei statue on the other side of the water at Almada. The name is a reference both to Lisbon’s own river and to Rio de Janeiro (known as the Cidade Maravilhosa) and a colourful sculpture of a female standing with arms spread, is a playful nod at both Rio’s Christ statue and the rather austere Christ statue across the river. Hanging out at LX Factory. (Photo credit: Red Fairy Project). Nearby, the Village Underground complex of co-working spaces is another hipster favourite, with shipping containers given a dash of colour from talented local street artists. Notably, you can have dinner or drinks here from a double decker bus on top of one such container. Alcantara is one stop on the train from Santos, where the cobbled streets are a mix of family homes – note the kids playing in the streets and the makeshift barbecues grilling fresh fish – tapas restaurants, pocket-sized bars and vintage stores. Next stop is Cais do Sodre, which has arguably assumed the title of “Nightlife central”, which until recently had belonged to Bairro Alto. An old market hall has been neatly transformed into a collective of critically-approved restaurant concessions and communal dining hall at Time Out Mercado da Ribeira (a fresh produce market still occupies one half of the building each morning); while the nearby Pink Street (the asphalt is literally bright pink) is a late-night hangout, whose hipster-approved hotspots include a former brothel re-appropriated as a collection of bars and shops at Pensao de Amor. Lisbon is famously Europe’s sunniest capital, and the best way to experience this scenic city is to spend as much time as possible outdoors. 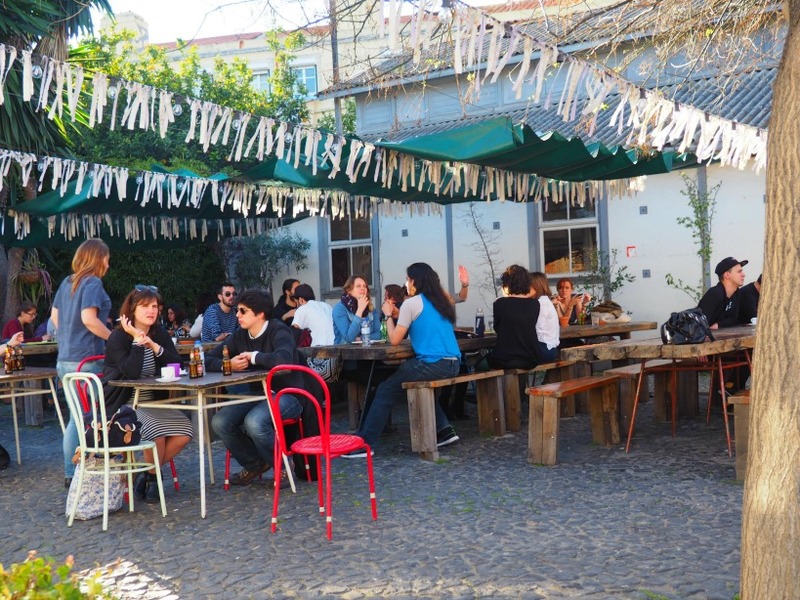 Unique to Lisbon is the ‘kiosk hop’ – this sunny city’s answer to the pub crawl. Retro-chic ‘refreshment kiosks’ serving everything from gin cocktails and sushi to fruit cordial and chocolate cake can be found at scenic spots across the city, and wandering from kiosk to kiosk is a great way to sightsee and sink a few drinks as you go. Built on seven hills, this is a city of many views, and no visitor should miss the opportunity to enjoy a bite to eat and a drink at one of the many ‘miradouros’ – viewpoints – dotted across the city. Kiosks and esplanade bars do a roaring trade in coffees and cocktails with a view, and in the summer months rooftop bars crop up across the city – be sure to check out Topo, in Martim Moniz, and Sky Bar on top of the high rise Tivoli Lisboa Hotel (the most famous of Lisbon’s rooftop hangouts). 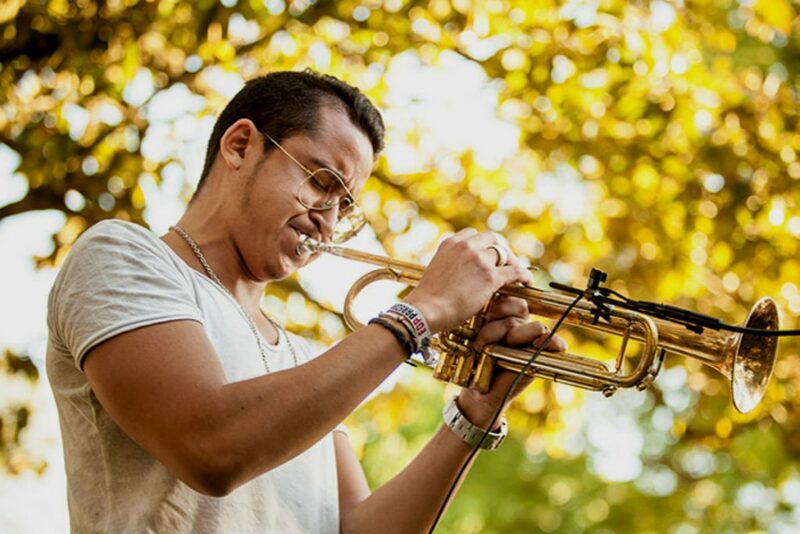 Jazzing it up in the city’s parks (Photo credit: Outjazz). Portugal is also one of Europe’s best locations for music festivals, and Lisbon is alive with the sound of music throughout the long, sunny summer – jazz comes to parks and public spaces during the Outjazz festival, while the Nos Alive festival in July has one of the best line ups of indie/alternative/rock and dance artists anywhere in Europe. 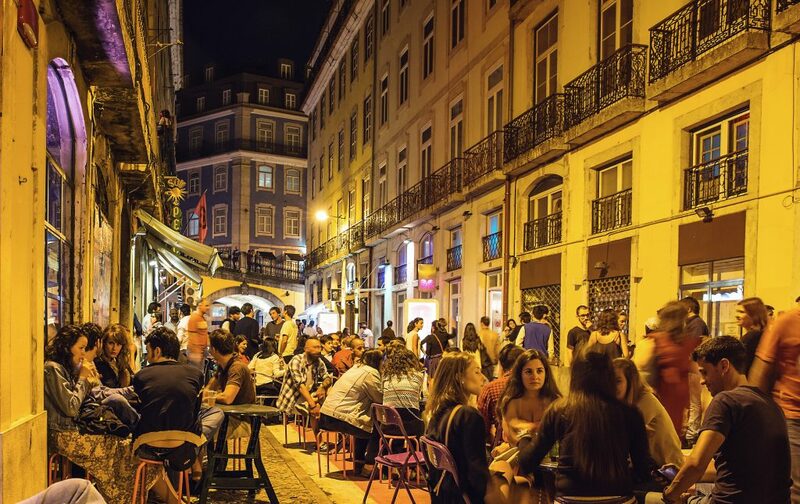 Drinking until dawn on the streets of Bairro Alto is a must-do for night owls, while June’s ‘Festas Populares’ see the city slip into party mode, fuelled by sangria, sardines and the sound of cheesy pimba pop music for night after night of street parties. Lisbon is also an increasingly popular spot with surfers – surf buses leave the city every day for perfect waves at wild beaches such as Guincho, while Costa da Caparica – just 10 minutes’ bus ride from the city on the other side of the River Tejo, hosts major surf festivals, with competitions, DJs, drinking and dancing. Lisbon remains one of Europe’s best value cities, and it’s easy to find above average digs at non-scandalous prices. Alongside one of the best hostel scenes in Europe, it offers some seriously chic boutique options. LX Boutique is a bold, blue hotel with a prime location close to Cais do Sodre nightlife (it’s not the best option for anybody looking to get a long night’s kip) as well as a sushi restaurant that is a major draw in itself. Alma Lusa, which opened in 2016, has a prime spot in the historic downtown, and the owners have transformed a lovely 18th Century building into a 28-room boutique hotel with a luxe feel. Hotels with pools are hard to come by in downtown Lisbon, but Memmo Alfama has a small infinity pool with spectacular views over the red roofs of the city and down to the shimmering River Tagus. This 42-room hotel has kooky touches such as a tiny library, and the Converse-clad staff will go out of their way to make a stay here memorable for all the right reasons. For chic stays that won’t blow the budget, Estrela Park B&B offers stylish rooms close to Lisbon’s gleaming white Basilica and the lovely Jardim de Estrela park for as little as 30 euros a night – there’s a kitchen, too, so guests can prepare their own meals. Families who want to see the city without little ones in tow can now check into fun and funky apartments at Martinhal Chiado Family Suites – billed as the ‘world’s first elegant city centre hotel’, these apart-hotels have a slick, modern design, and neat services such as baby-concierge (who will shop for nappies, baby food and other necessities) and a Kids’ Club mean Mum and Dad can enjoy a stress-free visit and even some child-free time in Lisbon. 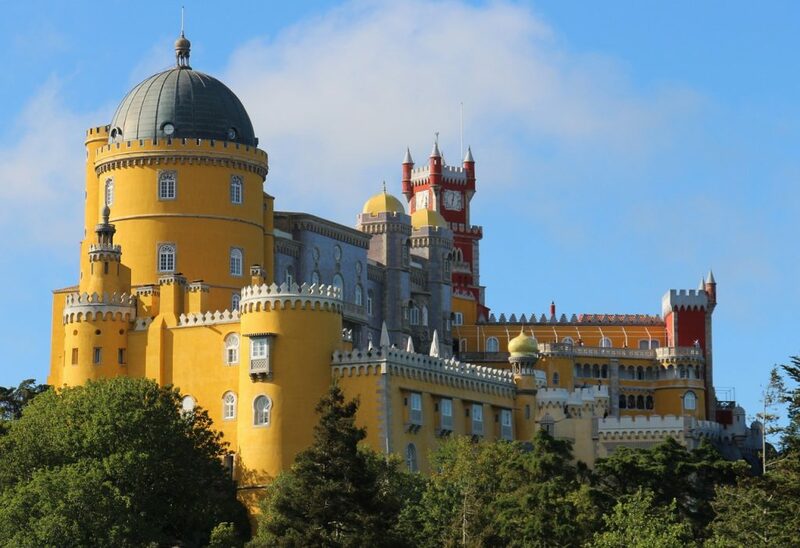 For more hotel options check Booking.com, or else search Lisbon for affordable apartments with Homestay.com (you get 5% off for being an Urban Travel Blog reader!). Lisbon’s dining scene reflects its multicultural makeup – coffee shops sell the city’s addictive pasteis de nata (flaky custard tarts) alongside strong espressos, seafood restaurants make the most of the coastal location, Indian restaurants abound, and it’s even possible to eat at ‘illegal’ Chinese restaurants operating from local families’ apartments. Lisbon’s most high profile chef is Jose Avillez, whose modern flair has earned him several Michelin stars. His restaurants in Lisbon include Belcanto, and he even has his own mini gastronomic ‘neighbourhood’ – with bistro, bar and foodie store – at Bairro do Avillez. Another trendy food spot is the Mercado da Ribeira, at Cais do Sodre. Sponsored by Time Out Lisbon, this hugely popular spot gathers together small scale versions of cherry-picked restaurants reflecting the best of the city’s culinary scene, from cakes to ceviche and cured meats. Lisbon’s nightlife scene is easily the rival of Barcelona or Madrid – be prepared for late nights, as things don’t really get going until after midnight. Bairro Alto is the classic hangout for bar-hopping and street drinking until dawn, but Rua Nova do Carvalo – the famous ‘Pink Street’ is a contender for the title of nightlife heart of the city, thanks to the hip crowds gathering at late-opening joints such as Pensao Amor – an aptly-named former brothel that today offers everything from drinking and dancing to racy shows and shopping. The summer nights demand drinking with a view, and Rio Maravilha, Sky Bar and Topo all offer a chance to admire panoramic views, sip cocktails and nibble on finger food alongside a hip young crowd. If you must go to a nightclub, Lux Fragil is the closest thing Lisbon has to a super-club, but beware the rather strict doorstaff. Village Underground also hosts regular club nights, with a varied musical menu taking in everything from electro to reggae and samba. Lisbon Portela Airport is served by budget airlines Ryanair, Easyjet and Monarch, with regular flights from several UK and European cities, as well as by US operators and the Portuguese national airline TAP. Note that prices soar over school holidays – outside these times, there are some extremely cheap flights to be found. There are also good rail connections within Portugal, and out to Spain and beyond. Once you land your most affordable way of reaching the centre of town is the Aerobus, whilst for door to door service from the terminal to your hotel best to order an airport transfer, which you can do via Book Taxi Lisbon. They have easy online booking and minivans (up to 7 people) and buses for larger groups. Lisbon Lux is a comprehensive guide (in English and Portuguese) to the best eating, drinking and sightseeing in the city (and despite the name, isn’t limited to high end options). NIT (New in Town) is a good guide to city trends for those who can read Portuguese, while Spotted by Locals is a nifty round up of new openings and happenings across the city, from an insider perspective. The tourist board website Visit Lisboa is a good place to come for info on getting around the city and its surrounds. Time Out Lisbon is the most comprehensive listings magazine for the city, while some interesting historic perspectives can be found in Fernando Pessoa’s classic 1925 book What the Tourist Should See – much of it is still relevant today. Wim Wenders’ 1994 documentary Lisbon Story is a nice overview of the city, while others have made the most of the city’s pretty setting – including the 1983 Swiss drama In the White City. The classic 1930s comedy Cancao de Lisboa (Lisbon Song) was remade in 2016, to reasonably positive reviews. 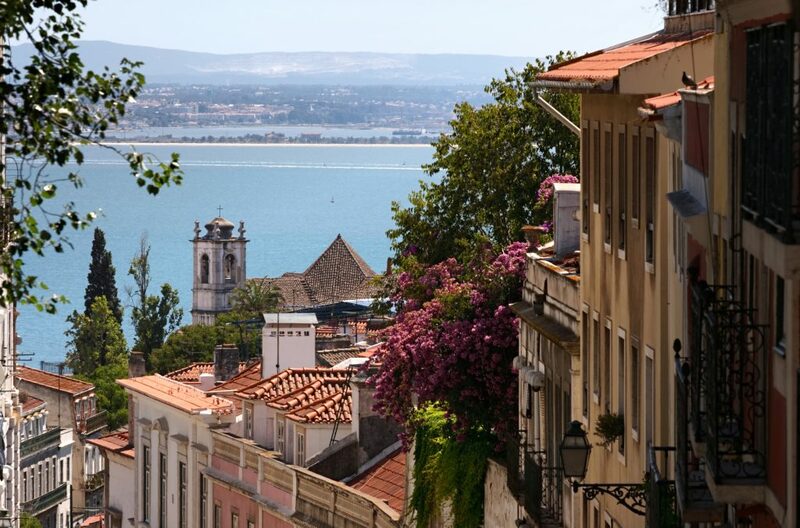 Once you’ve enjoyed your weekend break in Lisbon be sure to check out our list of city break destinations for more travel inspiration. 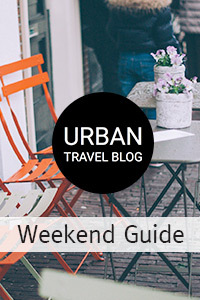 With insider guides to more than 70 great cities we’ve got you covered! Lisbon is packed with turists these days so expect long queues for anything that is slightly popular, overcrowded streets that cause you stress and artificial souvenir shops everywhere. Also, Lisbon became very expensive over the past years featuring currently in the 100th most expensive cities in the world (http://www.theportugalnews.com/news/lisbon-in-top-100-most-expensive-cities-in-the-world/46025). If you want to have an authentic cheaper experience you should go somewhere else in Portugal (e.g. Aveiro, Coimbra, Guimaraes, Nazare, Obidos, Evora, Tavira, Lagos, Vilamoura). Lucy is a British travel writer (Fodor's, Vice, Rough Guides) who moved to Portugal in 2015 after 10 years in Rio de Janeiro. She lives just outside Lisbon where she spends most of her time, when she's not on the beach or running in the Serra da Arrabida.